The cast of Mr. Burns, a post-electric play. Photo by Duy Nguyen. This seems to be the central question at the heart of Mr. Burns, a Post-Electric Play, an undeniably brilliant piece of writing. 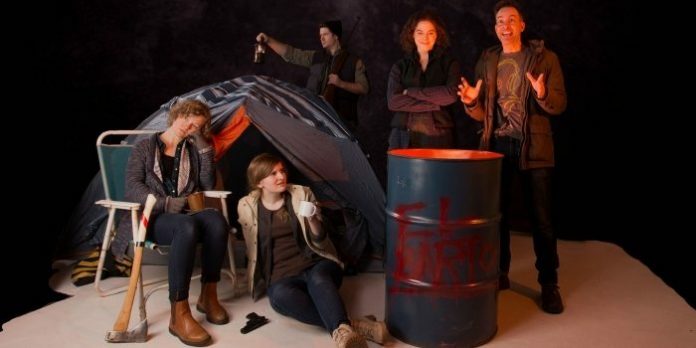 In each of the play’s three acts a group of post-apocalyptic survivors revisit and retell an episode of The Simpsons (Cape Feare, where Sideshow Bob tries to kill Bart on a houseboat). In act one, it is three months after the undisclosed catastrophe. The power grid has collapsed, nuclear plants are in meltdown, and a rag tag, destitute few gather around a flaming barrel. Together, they try to remember the plot and dialogue of the TV program. The second act begins seven years later, where the survivors have banded into a travelling theatre troupe. While rehearsing their production of Cape Feare (complete with commercials), they bicker over rival companies who possess better quality episodes and fervently hope for lines from the show to return to their memories. In act three, we leap forward 82 years and abandon the frame work of real-world characters. Instead, we are watching a fully-staged production of the episode presented as hybrid of Greek drama, musical theatre, and morality play. Most rewardingly, we see the earliest threads and subtlest hints from the first two acts woven into the fabric of the story; the familiar episode is morphed into something that could only be a product of this specific world. The ultimate payoff is incredible and will set minds reeling for days to come. It is the type of work that merits multiple viewings to better appreciate the layers of nuance and foreshadowing that are inevitably missed the first time through. In addition to a clever overarching structure, playwright Anne Washburn does a brilliant job of bringing her world to life through tiny details. In act one, for example, each survivor carries a notebook of individuals they’ve encountered the wasteland and – on meeting any stranger – they enter a ritual of comparison to see if they ‘have’ one another’s loved ones. Washburn’s script is brought to life by a company of seven actors who form an beautifully cohesive ensemble under Madelyn Osborne’s direction. Whether shouting one another down with guns drawn or performing a song-and-dance megamix of Top 40’s hits (one of the works undeniable highlights), the timing, connection, and chemistry between the artists is – ironically – electric. From a production perspective, the demands of this work are enormous – with each act effectively representing its own show from a set, prop, and costuming standpoint. The design elements, particularly the costumes of Johnny Hamilton and Madelyn Osborne and the masks of Sarah Elizabeth, are gorgeously done and offer visual intrigue that keep audiences deeply engaged. 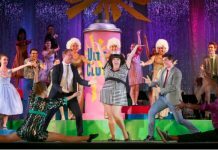 The work has the utter ingenuity, scrappy tenacity ,and pop culture cleverness typically associated with a world-class Fringe hit. With a two-and-a-half hour run time however, the duration can feel excessive for the content – particularly as each act effectively starts fresh, rather than picks up a narrative thread. But for those who like smart art that also makes them laugh – and for those who enjoy deep intellectual forays into the role of art in society – Mr. Burns offers a rich evening of entertainment and insight. Mr. Burns, A Post-Electric Play by Anne Washburn. Directed and Choreographed by Madelyn Osborne. A Little Mountain Lion Production. On Stage at Studio 1398 (1398 Cartwright Street) until April 21. Tickets available online at Theatre Wire.